"Itâ€™s a grubby, violent, dangerous world. But itâ€™s the only world they know. And theyâ€™re the only friends Eddie has." 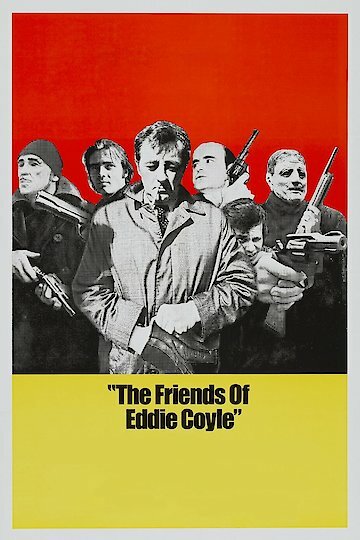 The Friends of Eddie Coyle is a 1973 film starring Robert Mitchum as a small time gun smuggler, Eddie Coyle. As his age is slowing him down, he's finding that he still has to resort to illegal activities in Boston to make ends meet. As he gets caught on one of his many capers, he's facing some more prison time. He faces a moral dilemma of turning in some of his trusted colleagues to the cops to save himself from hard time, or honor the gangster code of never being a snitch. Coyle has to wrestle with his conscience as he struggles with reality. The Friends of Eddie Coyle is currently available to watch and stream, buy on demand at Amazon, Vudu, Google Play, iTunes, YouTube VOD online.